A diphthong is a type of speech sound, which is articulated through the tongue commencing in the position of a single vowel and moving continuously in the direction of another. For example, [əʊ] in English low is a diphthong. It is important to note that this is not the same as a sequence of [ə] followed by [ʊ], which are distinct vowels pronounced as part of different syllables, whereas a diphthong is pronounced as part of a single syllable. The term is originally from Greek, meaning "double sound". In historical linguistics, the phenomenon that a monophthong gradually evolves into a diphthong is called diphthongization or vowel breaking. 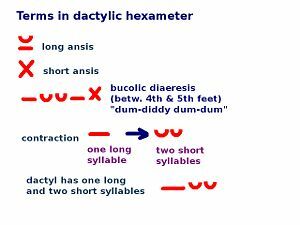 Diphthongs were used in epic poetry in dactylic hexameter, which is also known as "heroic hexameter". This is a form of meter in poetry or a rhythmic scheme. It is traditionally associated with classical epic poetry in both Greek and Latin and was considered to be the Grand Style of classical poetry. It is used in Homer's Iliad and Odyssey and Virgil's Aeneid. This page was last modified 20:13, 15 November 2013.